Apple 9.7" iPad (2017, 128GB, Wi-Fi Only, Gold). Apple updated their classic gold 9.7" iPad with an Apple A9 chip, which also has a M9 motion coprocessor. The display also has multi-touch support. Apple A9 64-bit SoC with M9 Coprocessor. TheiPad Air fromApple features an even thinner design than its predecessor. The iPad Air may be thinner and lighter, but it's still durable and solid. That's because it still has an aluminum unibody design. IPad has no signs of wear. Trending at $349.85eBay determines this price through a machine learned model of the product's sale prices within the last 90 days. Apple iPad 5th Gen. 32GB, Wi-Fi, 9.7in - Space Gray (CA). Shipped with USPS Priority Mail. Trending at $184.95eBay determines this price through a machine learned model of the product's sale prices within the last 90 days. 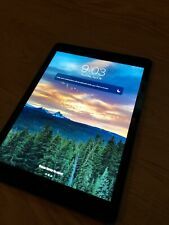 Apple iPad 5th Gen. 32GB, Wi-Fi, 9.7in - Space Gray (CA). Does not come in original packaging. Apple 9.7" 128GB WiFi Only iPad. Apple 9.7" iPad 128GB, Wi-Fi Only - Silver. Apple updated their classic silver 9.7" iPad with an Apple A9 chip, which also has a M9 motion coprocessor. The display also has multi-touch support. Apple iPad 5th Gen. 32GB, Wi-Fi 9.7" Gold Pre Owned iCloud CLEAR Cracked Screen. Condition is Used. Shipped with USPS Priority Mail. SCREEN IS CRACKED IN ONE CORNER. LOOK AT THE PICTURES AND KNOW WHAT YOU ARE BIDDING ON. Works perfectly and the crack doesn't interfere with the operation of the tablet as it works perfectly. Has a few barely noticeable scratches on the back. Model: IPAD (5TH GENERATION) WIFI CELLULAR 128GB SPACE GRAY [A1823] [IPAD6,12]. SIMLock Status:Unlocked. Carrier: Unlock. Find My iPhone:OFF. Loaner: No. Replaced: No. IPad 5th Gen 32GB. No cable included. iPad 32GB 5th Generation - Space Grey (PPJ017745). Condition is Used. Shipped with USPS Priority Mail. Everything works great, the screen has some small scratches and marks, barely noticeable. As seen on the pictures. Used Apple iPad 32GB - Space Grey (2017 Model) with official Apple Smart Cover and usb to lightning cable. This tablet is for the AT&T network. AT&T is a GSM network. This iPad was powered on, wiped, and reset to default settings. Physically, this iPad has light scratches & scuffing from normal use. The touch screen has light scratching. Trending at $253.18eBay determines this price through a machine learned model of the product's sale prices within the last 90 days. Apple iPad 5th Gen. 32GB, Wi-Fi, 9.7in - Space Gray (CA). Condition is Used. Shipped with USPS Priority Mail. Apple iPad 5th Gen. 32GB, Wi-Fi Cellular (Unlocked), 9.7in A1823. Condition is Used fair. This item is AS IS. Only SERIOUS biders. Payment is expected within 4 days of purchase or item will be reauctioned. PLEASE READ CONDITION: No scratches on screen. Back of tablet has scratches around the apple from rubbing of case. Tablet is in well used condition. Shipped with USPS Priority Mail. 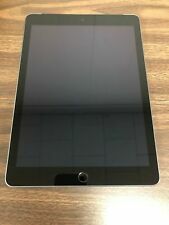 Apple iPad 5th Gen. 32GB, Wi-Fi Cellular (AT&T), 9.7in - Space Gray. Condition is Used. Shipped with USPS Priority Mail. Apple iPad 32GB - Space Grey (2017 Model). Condition is Used but looks Brand New. Comes with Case. Shipped with USPS Priority Mail. The greatest ipad model at an amazing price!!! 5th Generation model in brilliant white!!! New, unused. Includes original charger and cable - also new/never used. Ipad does come in manufacturing packaging, but is not the traditional white box as seen in Apple retail stores. Never activated and comes with warranty. You will love it!!! Apple 9.7" iPad 32GB Wi-Fi - Space Gray (MP2F2LL/A). Apple updated their classic space gray 9.7" iPad with an Apple A9 chip, which also has a M9 motion coprocessor. Make: Apple. Product Family : iPad. Condition is excellent. All accessories are In excellent condition. 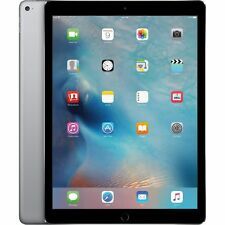 Apple iPad 5th Gen MPGT2LL/A 9.7 inch (WiFi Only) Tablet - 32GB - Space gray A1822. Condition is used. No scratches or tears on screen and back. Rarely used. Shipped with USPS Priority Mail. This unit shows light to moderate signs of use, including scratches and scuffs throughout the screen and back casing. The AC adapter and lightning cable are not included. Tested for Key Functions, R2/Ready for Resale. Item is missing Sims card holder and is locked, it can be factory reset on iTunes I don't have wifi to do that. im not sure what network it's on or if it's unlocked. iPad has one small crack on top back other than that is in flawless condition. Apple iPad 5th Gen. 32GB, Wi-Fi Cellular (Verizon), 9.7in - Space Gray. Condition is Used. Shipped with USPS Priority Mail. iPad is in excellent condition. Comes with a keyboard case that was only used a few times and also a uag case it was kept in. Absolutely nothing wrong with any of it,had to upgrade for work. Apple iPad 5th Gen. 128GB, Wi-Fi, 9.7in - Space Gray. Condition is Used. MP2D2LL/A Very good condition. Hardly ever used. Always kept in a case. Works and looks brand new! Everything pictured is included. Shipped with USPS Priority Mail. Apple iPad 32GB - Space Grey (2017 Model). Condition is Used. Shipped with USPS Priority Mail. Trending at $189.49eBay determines this price through a machine learned model of the product's sale prices within the last 90 days. This unit shows moderate signs of use, including multiple scratches on the screen and back casing, along with dents on the back casing. Tested for Key Functions, R2/Ready for Resale. This information is available at checkout. Apple iPad 5th Gen. 32GB, Wi-Fi, 9.7in - Gold with box. Shipped with USPS Priority Mail. ipad comes with box and charger and wire. mint condition. Zagg Screen Protector and Two Cases! Brand New/Sealed Box Apple iPad 5th Gen. 32GB, Wi-Fi, 9.7in - Space Gray. Condition is New. Shipped with USPS Priority Mail. Apple iPad 5th Gen. 128GB, Wi-Fi, 9.7in - Space Gray WITH SMART COVER!!. Condition is Used. Shipped with USPS Priority Mail. SOLD AS IS. NO RETURNS. SMART COVER INCLUDED! The Smart Cover shows signs of wear from usage including the inner folding edge fabric coming lose (see photo). However this doesn't hamper the cover's functionality in anyways. Very good condition. Wi-Fi (802.11a/b/g/n/ac). Multi-Touch screen. 10-hour battery life. Embedded M9 coprocessor. A9 chip with 64-bit architecture. Apple iPad 5th Gen. 664gb Wi-Fi, 9.7in - Gold - Grade A. Condition is Used. Shipped with USPS Priority Mail. Apple iPad 9.7" 128GB Space Gray Wifi 5th Gen MP2H2LL/A 2017 Model. Condition is Seller refurbished. Shipped with USPS Priority Mail.